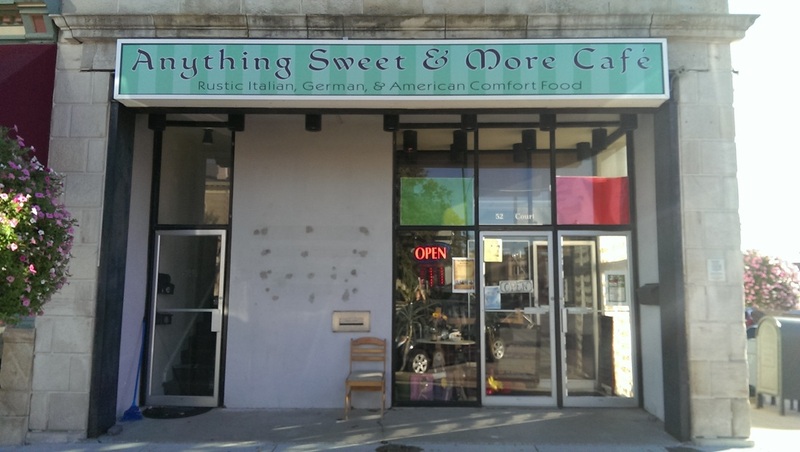 Anything Sweet & More Café originally opened as "Anything Sweet & More" on the west side of historic Downtown Square in Winterset, Iowa on 11 February 2012 as a pastry, bread, pie, & sweets shop. Customers loved our chocolates, breads, & candies, and then we were asked if we'd start serving lunch, With a high demand for a fresh, casual, unique lunch spot in Winterset, of course, we listened! In March 2012 we began serving hot, homemade entrees, soups, & fresh, made-to-order sandwiches, along with our delicious hand-made & imported gourmet chocolates & desserts. We're pleased to be a popular lunch spot for both area residents & tourists, as well as a meeting & dining place for groups, and events such as birthdays, family meetings, car show enthusiasts - everyone has a cozy spot to get together in our cafe. We were excited to expand to a larger location on the south side of The Square in July 2013. Our need for more space is a compliment to our great food & our wonderful customer base, & having more space has also allowed us to offer some fun events. Look under our "What's Delicious/What's The Event" tab to see what we're currently offering - it might be a special dinner or even a murder mystery. We also have yearly Events: join us for Prom Night Celebration, Mother's Day Brunch, Father's Day Picnic, Valentine's Day Dinner, & of course, we will also have our annual Cookie Decorating for Kids during the holiday season. DINNER AVAILABLE FOR FOUR OR MORE PEOPLE UPON REQUEST WITH SIX HOURS' NOTICE. Our menu offers selections celebrating Italian, German, & American heritage with an emphasis on made-from-scratch selections using only fresh ingredients. We always have Daily Specials that entice you to try something new. Whether you're looking for a meeting place or just out for an excellent bite to eat, we are happy to accommodate special requests - vegan, vegetarian, gluten-free, or other requests are our pleasure. Our atmosphere is casual, clean, & friendly & we're always glad to see you!